Figure 1. Hybrid-Maize Model locations. When the range of possible (i.e., simulated) end-of-season yield potential for the current year is compared to the long-term average yield potential (Long-term Yp, third column from left in Tables 2 and 3), it is possible to estimate the likelihood for below-average (75%), average (median, 50%), or above-average (25%) yields. Comparing estimated 2014 median Yp versus the long-term Yp gives the yield difference from the mean. Minus ("-") and plus ("+") signs next to the median Yp forecast (fourth column from right) indicate that median Yp forecast is well below (i.e., <-10%) the long-term Yp (minus sign) or well above (>10%) the long-term Yp (plus sign). At a given site, the 75% scenario is most likely if weather conditions are harsher than normal (for example, dry weather or early killing frost) from Aug 30 until crop maturity, whereas the 25% scenario could occur if weather is more favorable (adequate rainfall, no late-season frost) than is typical for this period. Therefore, for a given location, there is a 50% probability that end-of-season yield potential will fall between the 75% and 25% scenarios. Another way to interpret these odds is to note that end-of-season yield is likely to be above-average when the 75% scenario is higher than the long-term Yp. In contrast, below-average end-of-season yield is likely when the 25% yield scenario is lower than the long-term Yp. As the season progresses, the range of yield outcomes will shrink as the estimated yield levels for the 75% and 25% scenarios converge towards the median value. The change in median Yp since the last Aug 15 forecast) is shown to understand how weather has affected Yp during the last two weeks (second column from right). Finally, the probability of an early killing-frost during grain fill is shown in the last column, based on the approximate date when 50% of the corn area was planted and dominant hybrid maturity at each location. (See Table 1.) Frost probability will be higher in fields planted later or with hybrids with longer maturity. Note that yield loss from an early-killing frost depends on how late during the grain-filling period the frost occurs. If the frost occurs a day or two before the crop reaches black layer, there would be relatively little yield loss whereas if frost occurs a week or more before black layer, the yield loss would be much larger. So, how reliable are Hybrid-Maize forecasts? In well-managed, timely planted fields that have good crop establishment and have not been damaged by hail, flooding, diseases, weeds, and insect pests, past experience indicates that estimates of yield potential using Hybrid-Maize are robust. In fields with poor establishment, high disease or pest pressure, or those affected by hail or flooding, as well as in fields replanted late due to devastating storm damage (as is the case in many fields in south central and eastern Nebraska this year), we expect Hybrid-Maize yield forecasts to be considerably higher than actual yields from such fields. Likewise, the model will tend to overestimate yields in crops that suffered large kernel abortion due to severe heat and water stress during pollination. Irrigated and dryland yield forecasts as of Aug. 30 are shown in Table 2 and Table 3. Median irrigated yield forecast is within ±10% of long-term average in Nebraska, except at Clay Center (+11%). There has been little change (≤3%) in yield potential forecasts since Aug 15, but now there is a 75% probability of above-average irrigated yields at all sites in Nebraska but one (North Platte). Simulations indicate that corn has reached maturity in Kansas (though, in reality, it is likely that some of the longer maturities planted in northeast Kansas will continue filling grain for a week or so) with simulated yield 10% to 25% higher than the long-term median at all sites. For dryland yields, there has been little change since the Aug. 15 forecasts, except for a +23% increase at Clay Center due to good rains the past two weeks (4 inches) and a -11% decrease at Custar, Ohio due to a dry spell. Simulated dryland yield in Kansas, where corn has already reached maturity, is 7% to 29% higher than the long-term median. In the rest of the dryland sites, median dryland yield forecast is near (35% of the sites) or well above the long-term average (65% of the sites), with a high probability of above-average yield at 82% of the dryland sites. 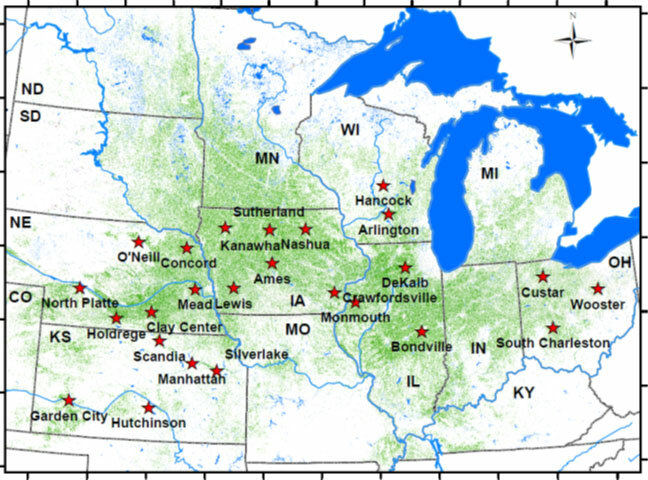 Late planting in 2014 has resulted in a high probability of early-killing frost during grain fill in the northern edge of the Corn Belt (Wisconsin and northern Nebraska, Iowa, Illinois, and Ohio), partly offsetting the positive impact of above-average rainfall and cooler temperatures on dryland and irrigated yields in the current season. Dryland and irrigated yields are likely to be well above average at a majority of sites. These forecasts do not take into consideration problems with stand emergence due to residue, hail/flooding damage, replanting situations, disease, or nitrogen leaching. While the risk of an early-killing frost is high at northern locations in the Corn Belt, the projected yield impact has diminished during the last two weeks due to warmer temperatures. We will follow-up with further forecasts in September.